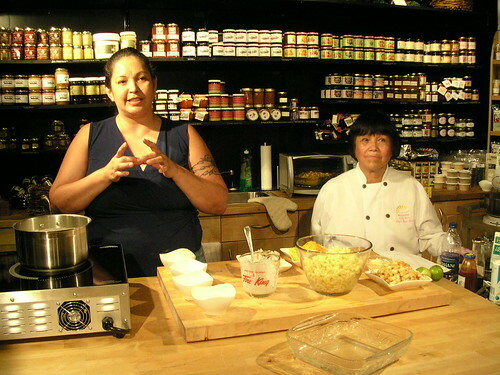 Two weeks ago, we went to see chefs Annie and Dolly Watts (above) of Davie Street’s now-closed Lileget Feast House hosting an indigenous cooking class in the Granville Island Public Market. Held twice a month, the cooking shows take place after the market closes in the Edible BC store. Up to sixteen students watch the makeshift class in the store’s small space, then sit down at a table to sample the five or so courses with a BC wine that complements each dish. We also got a ten-percent discount during the after-hours shopping as well as a black Edible BC tote bag and, for this class only, an autographed copy of the Watts mother and daughter team’s new cookbook, Where People Feast. The three-hour course also left plenty of time for the participants to meet one another over the meal. We mostly chatted with Monique of Vancouver blog So Misguided, a speed reader and a nice extrovert. We also enjoyed meeting the friendly Edible BC staff, including co-owner Eric Pateman. Wildman Salad with fresh blackberries and poppy seed dressing and a glass of Nk’Mip 2005 Pinot Blanc: my companion Matt of Onomatopoeia complained that the dressing used up too many pans and that the blackberries’ grit bits bothered his teeth. All the wines of the evening came from the Okanagn’s aboriginal-owned Nk’Mip Cellars. Stuffed Duck Roll with local cranberries, roasted yam and feta salad and a glass of Nk’Mip 2005 Riesling: rather difficult to make and an overnight process, this duck dish, however, would make a great Thanksgiving or Christmas dish. Pacific Macaroni and Cheese with fresh Dungeness crab and bannock crumbs and another glass of Nk’Mip 2005 Qwam Qwmt Chardonnay: hardly indigenous as the name implies, but who’s holding Germans to only eating sauerkraut or the English to their boiled flaccid vegetables? Let the people experiment. Rather delicious, I would have called this something snobbier, like Rigatoni alla bannock. One of my fellow diners picked out every single pea; usually I too am picky and shun celery. But I found that the celery did what it’s supposed to do for once and enhanced the flavour without bullying its way to centre stage. Yel’iss or Sopalali Mousse with Nk’Mip 2005 Riesling Icewine: we’ve always loved sopalali mousse, in fact, this cooking course was partly an excuse to find a soapberry supplier. Unfortunately, it’s an acquired taste for most white people. One lady vociferously refused to touch her glass. Once we convinced her that she could mix it with the blackberry syrup at the bottom of her glass for a sweeter taste, she did finish off her glass. I’m a failed wine drinker, yet I overly appreciated the ice wine, downing my companion’s glass in addition to my own. 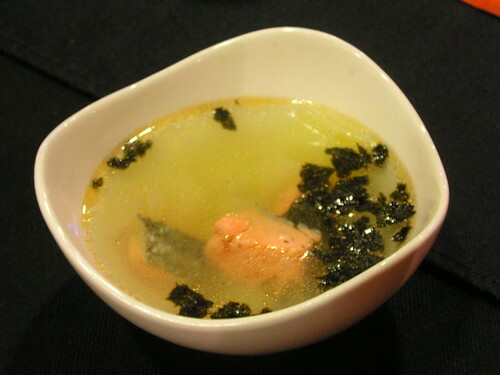 All that was missing from the feast was oolichan oil, though does make an appearance in Watts cookbook, along with another favourite of mine, pine tree tea. We’ve decided to attend more of these yummy cooking shows when we get the chance. Chef Don Letendre of Opus Hotel’s Elixer is almost sold out on October 9 and Vikram Vij’s class on November 13 is sold out, but there are many other classes available. Wow sounds great! I am one of the lucky few who got tickets to the Vij class, can’t wait.